Like most modern companies, here at Goya we use web-based tools. Slack, Dropbox, Zendesk and Mailchimp are awesome platforms to organise our work and to share our ideas. The best part though is that we can manage all these services from a FileMaker solution. 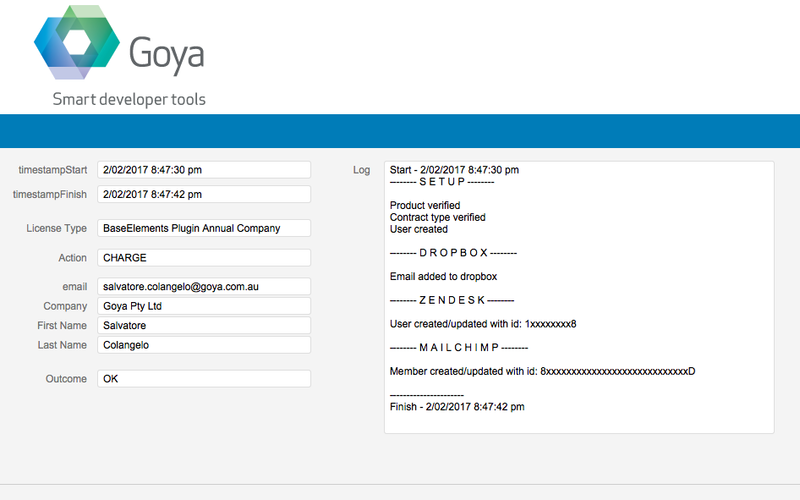 Which is exactly what happens when someone joins one of Goya’s sponsor programs: their Dropbox, Zendesk and Mailchimp account details are auto created via FileMaker scripts. Pretty neat, it saves us quite a few clicks! We are able to call the web services from FileMaker using the HTTP functions from the BaseElements plugin, and then parse the results using the JSON ones. Want to try it yourself? In the coming weeks we will publish articles here and add examples to the share folder available to all our sponsors. If you’d like copies of our example files, please consider signing up as a sponsor. Next week FileMaker integration with Dropbox. or check out this excellent introduction to web services from Mason Stenquist at DB Services.